At the northern gateway to Patagonia is a fertile and beautiful land. This small group adventure gives you the opportunity to spend 16 days cycling through the lake districts of Chile and Argentina. You’ll be transported to a magical landscape that’s chock full of turquoise rivers, active volcanoes, enormous lakes, and ancient native forests. Imagine Andean condors swooping down the cordillera foothills as you cycle on the most scenic paved routines in all of South America. This is your chance to get a deep cultural insight into both countries – including how European influence and indigenous rituals and customs. The ride is fully vehicle supported and the group will stay in hotels along the route. There are nine full days of cycling with an average daily distance of 44km. The terrain is primarily tarmac with about a quarter of the route being rough roads. Traffic is heavy as you approach cities, but you don’t need to be a pro to enjoy this ride. Cross the Andes twice in grand fashion as you cycle through this adventure. Travellers on our group flights will arrive to Puerto Montt airport today after connecting in Santiago de Chile. There will be a group transfer from the airport to our start hotel in the nearby town of Puerto Varas. For those people who have booked Land Only and made their own travel arrangements, you are welcome to meet the group transfer should you wish (and have informed us in advance) otherwise the meeting point is at the start hotel in Puerto Varas anytime in the afternoon/evening. *Standard Hotel*. 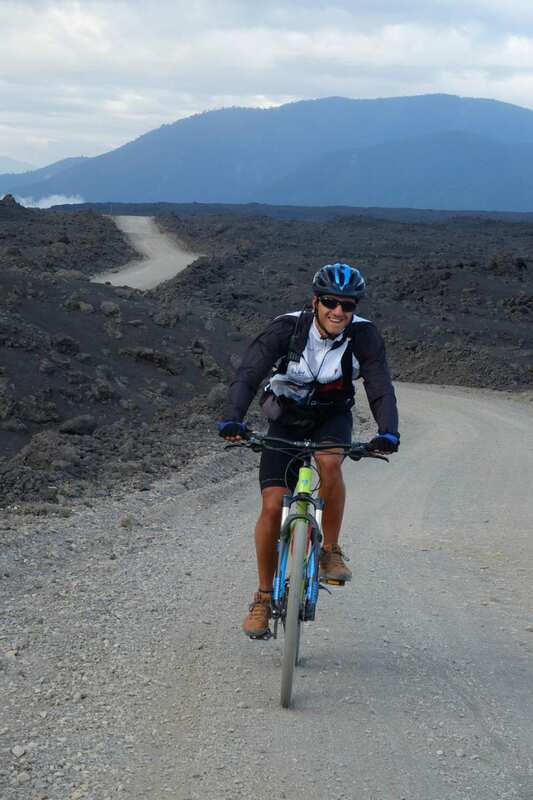 Our Lake District cycling adventure starts off today in scenic fashion as we navigate clockwise around the shore of Lago Llanquihue (the third biggest lake in South America) and stretch our legs for the more challenging days ahead. From the lakeside road we will enjoy spectacular views of the volcanoes and the Andean mountain range that lie just to the east. Volcanoes Osorno (2652m), Puntiagudo (2190m), Tronador (3451m), Puyehue (2240m) and Calbuco (2015m) are all visible on a clear day. We’ll cycle to the picturesque lakeside village of Frutillar, a German influenced settlement which is home to the modern 'Teatro del Lago' theatre. The ride ends here and after lunch we’ll transfer back to Puerto Varas. *Standard Hotel*. We follow the shoreline of Lago Llanquihue once more today but in an easterly direction past Puerto Chico and Ensenada, straight towards the imposing Calbuco and Osorno volcanoes. Gateway to the Andean Lakes, our journey from here across the mountain range takes us in to more remote and spectacular environments. We cycle onwards, following the banks of the emerald coloured Rio Petrohue towards the 'Saltos de Petrohue' waterfalls. Upon reaching 'Lago Todos los Santos' we are greeted by a beautiful setting and we'll swap our mode of transport in order to board a catamaran ferry. Cruising across the lake is a wonderful and peaceful experience as we keep our eyes peeled for Andean condors flying overhead (journey time approx. 1.5/2 hours). *Standard Hotel*. After breakfast we start cycling towards the Argentinian border which involves riding 20km with a steady incline before taking on a challenging climb (approx. 700m over 7.5km) to reach the frontier. There is then a short descent into Puerto Frias. Depending upon how the weather has been in the proceeding days, the unpaved mountain roads can either be well compacted or sometimes loose and dusty. The final leg of today’s iconic journey across the Andes is a short ferry crossing on Lago Frias followed by a 3km ride to your hotel in Puerto Blest. *Standard Hotel*. Puerto Blest is situated on the westernmost point of Lago Nahuel Huapi and from here we board a catamaran to take us to Puerto Pañuelo. Instead of cycling directly towards Bariloche, we will take a scenic route on a paved road that loops around via Punto Panoramico to enjoy an awe-inspiring view of the Argentinian Lake District. As we approach Bariloche we will board the bus for a short transfer (approx. 20 minutes), linking up with the lakeside main road. *Comfortable Hotel*. After several days of travelling, today is a free day allowing a well-earned chance to relax and take in the beautiful surroundings of the Lake District. You may wish to take a look around the centre of Bariloche, a ski and adventure sports hub with numerous chocolate shops. There are plenty of adventurous activities available should you wish to indulge, such as guided ‘stand up rafting’ on Rio Limay, or the opportunity to independently trek up to Refugio Frey and back again on the slopes of Cerro Catedral. *Comfortable Hotel*. After breakfast we’ll transfer for approx. 1.5 hours around the northern edge of Lago Nahuel Huapi to bypass the busy Bariloche traffic and reach the starting point for another spectacular cycling route. The 'Camino de los Siete Lagos' (Seven Lakes Road) is an incredibly scenic route that winds its way northwards past lakes and forests connecting the alpine towns of San Carlos de Bariloche and San Martin de los Andes. Depending upon the exact start point, today involves us riding a total distance of around 52km through spectacular and rewarding landscapes. We will break the ride up with a lunchtime picnic stop and should therefore arrive in San Martin de los Andes in the afternoon. Entering in to the picturesque small town of San Martin involves a wonderful approach along the shore of Lago Lacar. *Standard Hotel*. After breakfast we will say goodbye to Argentina and cross back into Chile via the Huahum Pass. We will have a short transfer to the border before we start cycling up to Pirihueico Port, crossing the Huilo Huilo Biological Reserve. We will make a stop for coffee and lunch at the port. From here we will take a barge (boat) that will sail us to Port Fuy, (approx 1.5hours). From here we will cycle to the village of Choshuenco. *Standard Hotel*. Today we start the day by cycling to Panguipulli Village. Here we wil have lunch before a transfer Pucón Town (approx. 1 hour). We will stay in a dowtown hotel, located by the feet of Villarrica Volcano (2840 m). *Standard Hotel*. Today is at leisure for you to choose from doing organised activities or having some time out. There are numerous nearby hot springs (termas) and spas in this part of Chile meaning Pucon is the perfect place to soothe away any bike-induced aches and pains! Your tour leader will be able to advise which local agencies to use depending upon what you would like to do. There is also a nice beach in Pucon just a short walk from the hotel, and there are lots of restaurants and bars to choose from.Should the local conditions permit then today is the perfect opportunity to climb to the crater of a live volcano! Villarrica Volcano (2840m) is situated just outside of the town and most recently erupted in March 2015. Obviously this activity comes with its risks and so the local tour company will only take groups if the conditions are totally safe. All equipment can be rented, meaning that you only need to bring your own waterproof walking trousers. The early morning ascent takes around 4 hours and involves wearing crampons to cross a glacier before a memorable and unique descent after reaching the crater (this isn’t for the faint hearted!). Depending upon the amount of snow at the summit, the normal way of getting down the volcano is to sledge down a specially crafted series of compacted snow and ice channels. This is a special experience from start to finish, but should only be undertaken if aware of the challenges.If you wish to cycle today then of course you can take your bike out and the tour leader will recommend some routes. *Standard Hotel*. Departing Pucon, we transfer northwards after breakfast to the town of Cunco. From here the cycling starts with a 33km stretch of paved road towards Conguillio National Park, stopping for lunch in Melipeuco. Shortly afterwards is the turn off to enter the national park where the road eventually becomes unpaved and dusty in places. From the entrance we will take a short walk to the Truful Truful waterfall. Afterwards we will carry on cycling for 7km until we reach our accommodation for the night.The scenes that we encounter today are vastly different from the rest of the tour. Clouds rise up from surrounding valleys and quickly change form whilst passing over the volcanic lava. Llaima Volcano (3125m) dominates the skyline and we spend the night in a remote and charming eco-lodge. The property restricts energy use as part of its self-sufficiency, meaning that electricity and hot water are not available during the night. *Standard Hotel*. It is our last day of cycling today as we continue riding further within Conguillio N.P. and see several beautiful lagoons (Laguna Arco Iris, Laguna Verde) and Conguillo Lake. We will also visit the parks interpretation centre in order to find out about how the park was formed. (Please note that this may not be possible as sometimes the centre is closed during our visit). We will then walk for an hour through the native forest to see ancient monkey-puzzle trees. Tonight will be the last evening all together with group and staff, so it is the perfect opportunity for a last meal and drinks to look back on what will have surely been a fantastic journey. *Standard Hotel*. All breakfasts, 9 lunches and 1 dinner included.Hotel breakfasts are normally buffet-style, and lunches will either be at convenient restaurant stops during our rides or packed lunches. There is a variety of good quality food on offer in the hotels and local restaurants for the evening meals that are not included in the price of the trip. Chile and Argentina traditionally have a lot of meat dishes in their cuisine, however vegetarians can be catered for throughout the trip. Please ensure that you advise us of any dietary requirements before you travel so that we can make the necessary arrangements on your behalf.